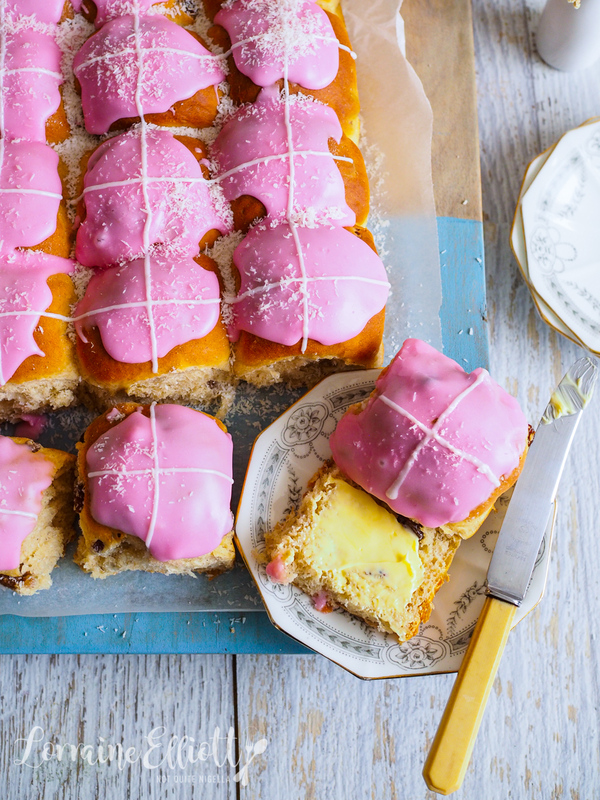 Criss-cross: A Finger Bun X Hot Cross Bun Mash-up! Every year my favourite thing to bake for Easter isn't actually chocolate related. In fact it is bread related. 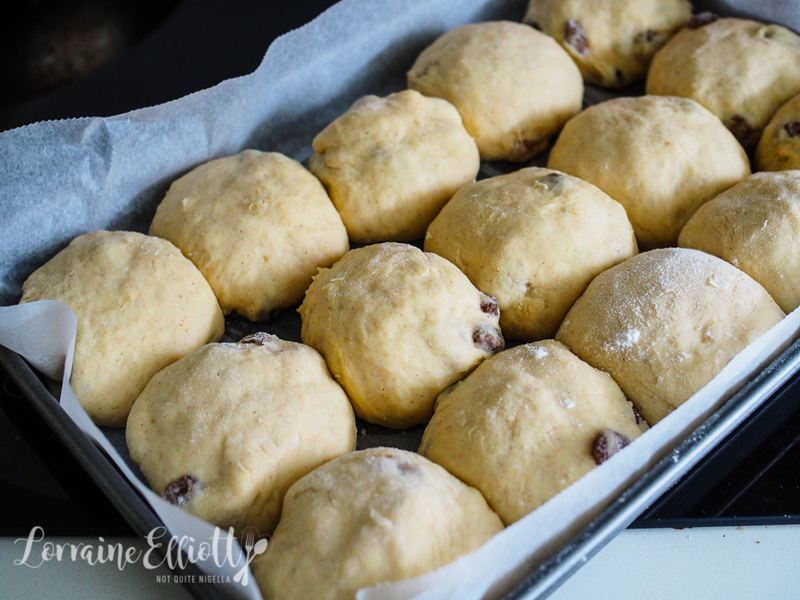 These Hot Cross Buns are fluffy and light and are just as good if not better than any you can buy. 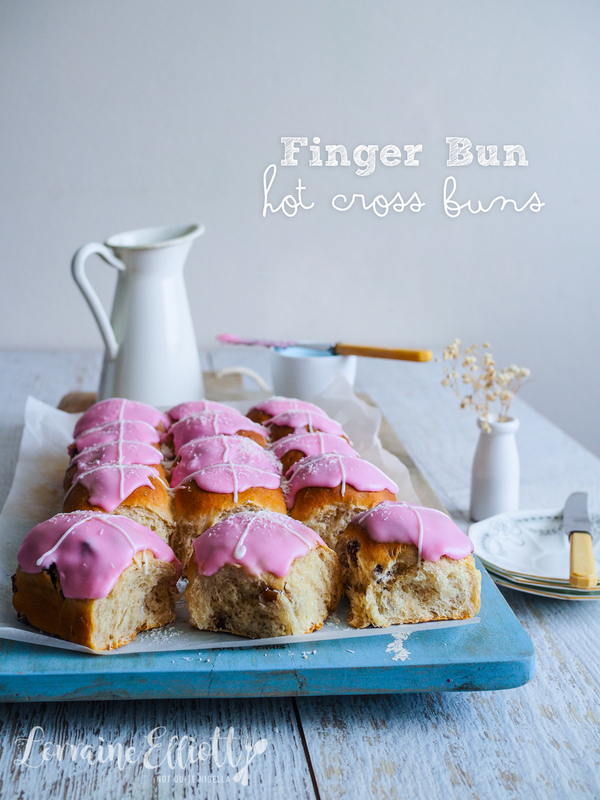 Every year I dream up a new flavour and this year's is inspired by an Australian classic: the finger bun! A finger bun is one of those classic after school Australian snacks. 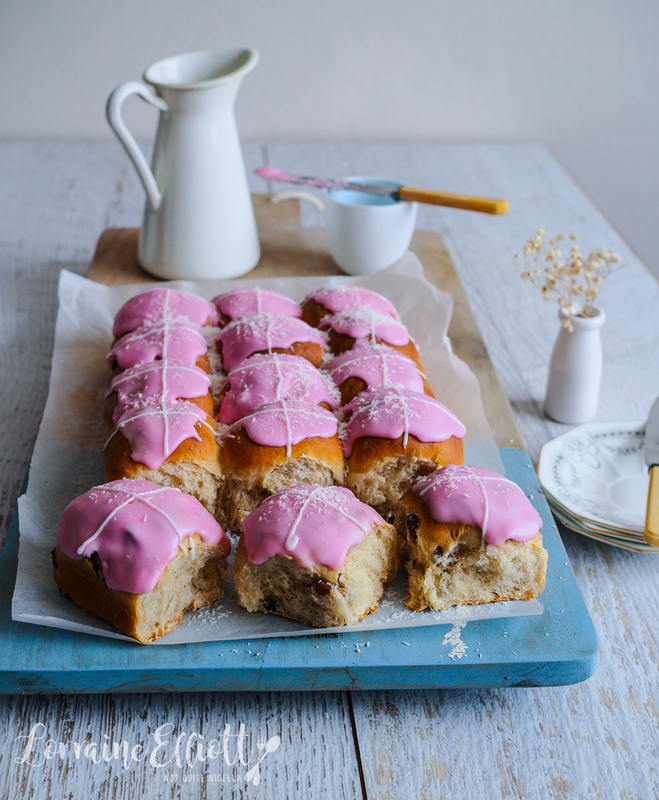 I have very fond memories of these pink icing topped buns usually dusted with coconut but I've also seen sprinkles on top of some. It has been quite a few years since I ate one as the shops selling these slowly dwindle in favour of newer, glossier bakeries with a glistening rotation of alluring baked goods. I hope they never die out though (and one can always be found in a country town which is where I usually buy custard tarts, finger buns, pies and vanilla slices from). And while these don't have the finger shape, they do have all of the finger bun flavour as they would be considered close cousins as far as ingredients are concerned. Don't let the lack of finger bother you I promise (and really you can have two, I won't tell ;)). Recently, I wanted to give the finger to a very loud group of people that I came across at a luxurious resort. We were sitting down enjoying the sand between our toes when a nearby group of dozen got louder and louder. It was a group from all over the world and we couldn't quite figure them out. They didn't seem particularly close, and their favourite past time seemed to be one upping each other. But we figured who would go to a place like this with strangers? One man lit up a cigar while another man (an Australian, I'm aghast to say) let out a tirade of racist jokes at the top of his lungs. Perhaps he didn't see the people who were serving him who matched the jokes' subject although I suspect he didn't care. They got much louder, drunker and took over the whole restaurant and the contrast of their boorish behaviour and the beautiful view on the other side was too much. We hightailed it out of there - I couldn't cope with their noxious energy and wanted to be as far from them as possible. For the next few days we managed to successfully avoid this roving scourge of humanity. However we were on the transfer off the island with them. We found out that they were actually guests of one couple (who admittedly appeared appalled at their antics) as they were their VIP customers. So their stay and food was paid for but any extras weren't. They held up the whole boat's worth of other passengers bickering and arguing over the bill and who drank what and who got which massage. So much so that everyone was held up over an hour while this group dragged it out. The hosting couple apologised to the rest of us several times, aware that people's holiday time was being wasted on these fools but the rest of them didn't care a bit. So tell me Dear Reader, what would you do if you came across people like that? 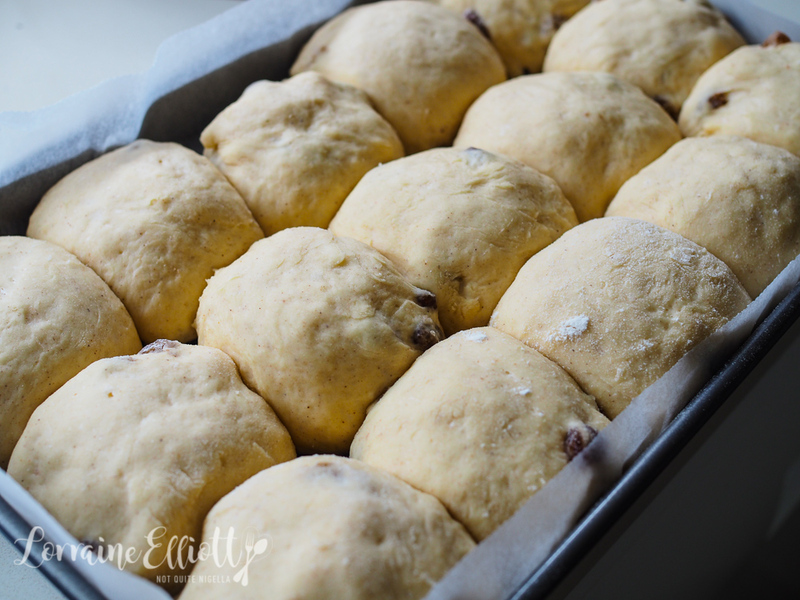 Do you make your own hot cross buns? And when is the last time you had a finger bun? What was your favourite after school snack? Step 1 - Make the tangzhong which is what makes this bread so soft with such a good staying power. Remove 1/6 of a cup of the bread flour from the total flour and place in a saucepan with the water. Whisk until smooth and heat until it reaches 65C/149F. Remove from heat and whisk in the milk, honey and eggs until smooth. Step 2 - Then place the rest of the flour in a mixer fitted with a dough hook. Add the yeast, cinnamon and mixed spice and mix to combine. Add the tangzhong mixture and butter and knead on the lowest speed. You want to achieve the window pane effect which is when you pull apart the dough with your fingers it doesn't break. This can take some time, even around 10 minutes or even more. Step 3 - Scrape the dough well from the bowl with a dough scraper or a spatula. Flour the dough and shape into a ball and place back in the bowl and cover with cling film and allow to triple in size (around an hour). Add the drained sultanas and salt and knead again until combined. Then line a couple of trays with parchment. Roll into balls and place them touching but not too close. I got 20 buns. Allow to rise again for 20-30 minutes. Preheat oven to 180/350F. Bake for 30 minutes. When they are done, place on a cooling rack. Step 4 - Sift the icing sugar and add a few drops of water (be very sparing with the liquid) and stir until you get a thickish but pipeable consistency. Place a couple of tablespoons in a small piping bag. 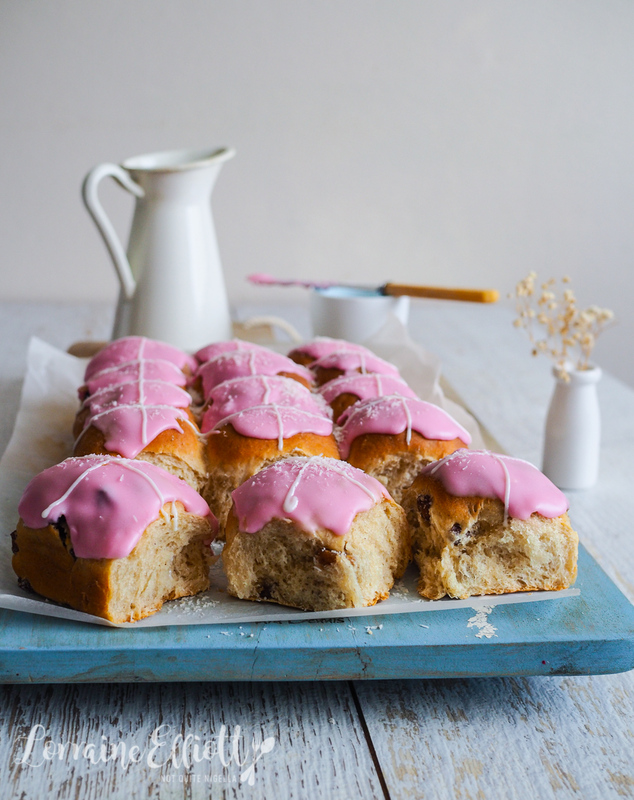 Then add a couple of drops of pink colouring and mix and then spread the pink icing over the buns. Sprinkle with desiccated coconut on top straight away before it sets. Then pipe white crosses with the icing. Slather with room temperature butter and watch it soak into the soft buns. Heaven. featureEaster Hen and Chick Nests! recipeHow To Make Fun Pokemon Go Pikachu Buns! recipeAmazing & Easy Christmas Tree & Wreath Twist Bread! recipeChocolate Filled Coloured Egg Shells! featureSalted Caramel Easter Egg Rocky Road! recipe How To Make Fun Pokemon Go Pikachu Buns! recipe Hallowe'en Scream Swirl Bread! recipe Amazing & Easy Christmas Tree & Wreath Twist Bread!